The trombone, Bruce Tychinski says, chose him. 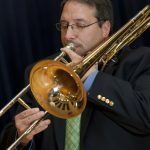 Now in his sixth year as associate professor of trombone at the University of Delaware, Tychinski grew up in Central Pennsylvania, and kids at his school started taking music classes in the fourth grade. His twin brother had known for a long time that he wanted to be a drummer, and Tychinski wasn’t interested in doing the same. He had a neighbor who played the flute, and Tychinski liked its sounds, but he wasn’t sure what he wanted to play. He listened to a few different instruments that summer. In the fall, the music teacher told him no one was playing the trombone, and so that’s what Tychinski picked up. He didn’t know at age 10 the part the instrument would come to play in his life. At first, the trombone was taller than him. In junior high, and through high school, he took private lessons from an older man who was a legend in town. Tychinski would listen to the teacher joyfully recount stories of playing trombone during World War II and locally with the symphony and with bands coming through town. “I think I started through osmosis to pick up his love for the instrument,” says Tychinski, 46. His family tree, to that point, had no branch that included a musician. He and his twin brother, now a high school band director, changed that. Tychinski is working to improve the level of trombone playing throughout the region. Since his first year at UD, he has hosted the annual Delaware Trombone Day. That first incarnation served 24 people, including his UD students. This year, there were more than 200 attendees, the youngest being fifth-graders, the oldest, 93 years. Tychinski also co-founded the First State Middle School Trombone Choir at the Music School of Delaware. It’s a free ensemble that draws students from local schools, programs a concert, arranges the music and rehearses several times. His hope is to build in the students the sort of experiences that in his youth nurtured his interest in trombone. The Division’s grant has made it possible for Tychinski to commission Anthony O’Toole, a Los Angeles-based composer, to write a new work for him with concert band accompaniment. He plans to premiere the piece, “Coalescence,” in May with the Cape Henlopen High School Band.